Robust support for Canadian involvement in any war, including the one in <?xml:namespace prefix = st1 ns = "urn:schemas-microsoft-com:office:smarttags" />Afghanistan, is generally a non-starter in Quebec. And so there is never a shortage of eager anti-war demonstrators here. Thus, I wasn't surprised when, last Saturday, the usual coalition of defenders of failed cultures were organizing a "peace" march in downtown Montreal. This rally's real purpose wasn't peace, though; it was to call for Canada to withdraw its troops from Afghanistan and let the Taliban thugs take control. Twenty-four hours before the march, a young ex-soldier asked me to support a counter-demonstration, which I did. The young patriot spent the night calling recruits and making signs -- "Support Our Troops" and "Stand With the Free." The next day, fierce rain leveled the playing field, attracting low turnout for both sides. But a dozen of us held up our signs and proudly waved Canadian and Quebec flags, earning a satisfying number of supportive car honkings. We also attracted a few media types. And here is where things got interesting. A radio reporter from the French language Radio-Canada asked us if our group was "against peace." In French, I explained we were demonstrating for our troops and for freedom, adding that our Prime Minister "had given this nation a brave and bold new vision and we should follow it." There was no talk of the Middle East or Iraq. Instead, we discussed Canada's role on the international scene. Suddenly, a propos of nothing I had said, she asked me if I was a Jew. "I'm a Canadian," I said. "And a democrat. I don't define myself by religion." I then asked her what reason she had for this question. As a journalist and activist, I am often asked about my religion -- but only by francophone reporters. She replied it was for "context." She replied that the "peace" marchers included representation and sponsorship from groups such as the Canadian Islamic Congress. It seemed to me that she could not comprehend that individuals could come together in support of an idea instead of a tribe. If there was a Muslim Committee on one side, she apparently reasoned, there had to be a Jewish committee on the other. I explained we were there as "free citizens." But she persisted. It was as if she could not understand that people can act out of individual initiative, without being frogmarched to the barricades by an acronymed ethno-religious group. As it happened, we discovered from a quick head count, three out of the 12 of us were Jewish. "Does that make it a Jewish conspiracy?" I asked her. She quickly terminated the interview, accusing me of prejudging her. Before she left, I reminded her of what a francophone senator once told me: that the real "two solitudes" in Quebec were not the Anglophones and the francophones, but those francophones who were the heirs of Papineau and Lafontaine, Laurier and Trudeau, as opposed to those who were the small-minded heirs of Maurice Duplessis' La Grande Noirceur, Lionel Groulx and Adrien Arcand. I asked her to reflect on whose heir she was. Nobody in the mainstream Quebec media, including that CBC reporter, denounced any of this. Was I disappointed? Yes. Surprised? No. It's all part of the "distinct society" we call Quebec. <?xml:namespace prefix = w ns = "urn:schemas-microsoft-com:office:word" />The rain seared our faces like icicles falling off a roof ledge. It was incessant and unforgiving. But there we stood, our little band of brothers and sisters, on one of Montreal’s busiest downtown corners under an angry, gray October sky. We stood there because we wanted to purge ourselves of some of our anger. Earlier in the week it was announced that the usual coalition of deniers, defeatists and defenders of failed cultures’ “right to be wrong” had organized another “peace” march. This one called for Canada to withdraw its troops from Afghanistan and let the Taliban thugs work things out with the people they had oppressed for so long. I must admit I was not even aware that this was going to take place. There are so many marches for so many retrograde causes in Montreal these days that it’s hard to keep track. As president of the Institute for Public Affairs of Montreal I had just concluded a Conference on the brutalization of human rights under Islamist regimes that focused particularly on the degraded status of women under those theocratic tyrannies. We had brought together for the first time anywhere some of the most authentic international voices of resistance to those tyrannies. Women who knew first-hand what it was really all about. Brigitte Gabriel, Dr. Wafa Sultan, Nonie Darwish and Nazanin Afshin-Jan.
A young man who attended our Conference brought this new “peace” march to my attention. An ex-soldier, now finishing his engineering studies, he was frustrated and perplexed that after Montreal’s August 6th “peace” march for Lebanon and Palestine that turned into nothing more than a rally for Hezbollah, there was to be yet another demonstration that would effectively manifest support for the Taliban, yet another army of Islamist killers. He wanted to do something. Anything. Even if it was at the last minute. He simply didn’t want to leave the playing field wide-open to the apologists and propagandists for hate. He knew he could turn out only a few people but that didn’t dissuade him. His idea was not to focus on opposing the other marchers, but on putting forward a positive message of where Canada should stand. He had even thought of a name for his newly-formed initiative. “The Montreal Alliance”. He came to me the day before the scheduled demonstration. I gave him what logistical, financial and organizational support could be mustered on what was literally an overnight operation. This young patriot spent the evening making up signs and calling whomever he could. So there we were waving Canadian and Quebec flags and holding up signs calling on passers-by to “Support Our Troops” and to “Stand with the Free”. Not bad messages those. A lot of people seemed to agree as the passing drivers honked their support. But we were few in number and though we had arrived a half-hour before the other side, we knew they had rented trucks and sound-equipment and had the benefit of several weeks planning. A journalist had cautioned me that perhaps I shouldn’t get involved since if we were out-numbered it would send a negative message. My answer to him was simple. At least there would finally be another message heard! I also reminded him to look to his Emerson who wrote words long ago that still resonate today. “One person – resolute – abiding by truth shall rally a majority.” It may not happen in one day. But it will happen. And this brave young man deserved all our help. The fates must have been watching over us. Though the others did outnumber us, they did not put on an impressive display. The fierce rain kept many away. And we got some media coverage. Cameras from two networks filmed. One or two reporters came and said they would be back. Then the funny thing happened. I had told my new young friend that I could only stay for about an hour. Just as I was leaving, a reporter from a French-language radio station approached. She seemed pleasant enough and asked the organizer if he cared to make some comments. Though fluent in French he said that he was not used to speaking to reporters and guided her to me. Out of the gate she pounced with the usual “progressive” bias asking if our group was against “peace”. 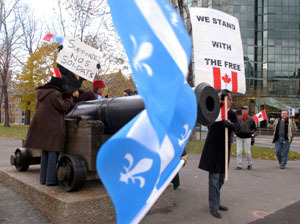 Patiently, in French, I pointed to our signs and explained that that was why were demonstrating. For our troops. And for freedom. That Canada has a responsibility, as a G-7 nation that takes so much in human and material resources from the third world where so many live under oppression, to shoulder its fair share of the burden in offering the oppressed millions there some hope. That if this country was not involved in mankind’s transcendent struggles for redemptive change then our own fleeting encounters with social justice was just so much self-delusion. That our Prime Minister had given this nation a brave and bold new vision and we should follow it. There was no talk of the recent Middle East war, Iraq or any parochial particularities. We talked of the need to support Canada’s newly restored pride and purpose on the international scene. We discussed the merits of the Afghanistan mission. We spoke of the necessity of Canadians, as members of the family of free peoples, needing to guard against giving comfort to the enemies of freedom and compromising the survival and success of liberty. I described our little manifestation as a rally of conscience similar to the “Red Friday” rallies in support of our Forces that are held across the country. That it was to our city’s shame that we have had no “Red Fridays” here. Then came the zinger. She asked me if I was a Jew. I snapped back “I’m a Canadian. And a democrat. I don’t define myself by religion. Are you a Catholic?” I demanded to know what possible reason she had for this question, and why I am so often asked my religion only by Francophone reporters. Defensively, she replied it was for “context”. I asked what “context”? Her answer was symptomatic of the social sickness that has made so many fey and feckless and too many so intolerant. She said that the “peace” marchers had groups such as the Canadian Islamic Congress participating and sponsoring. I asked “So what?” We were there as free citizens. That was our title. That was our tie. Openly flustered and upset she then abruptly terminated the interview and accused me of pre-judging her. She quickly disconnected her tape recorder from the microphone and stuffed them both into her purse while reaching for her umbrella that I had been holding over her. In a hurry to cross the street, she turned from me but I persisted in reminding her of one thing. The fact that she – a journalist – a member of a profession that should prize individualism and independence, could not accept that people can act without regard to any collectivity was part of a disease destroying our society. So much has been surrendered to statocratic collectivist consensus that even freedom of thought, action and assembly are suspect. And, sadly, the age-old spectres of the “Jew” as outsider, of the “Jewish conspiracy”, still rear its ugly head. I reminded her of what a Francophone Senator once told me. That the real “two solitudes” in Quebec were not between anglophones and francophones but between those francophones that were the heirs of Papineau and Lafontaine, Laurier and Trudeau, and those francophones who were the heirs of the era of “le grande noirceur”, Abbé Groulx and Adrien Arcand. I told her to reflect on whose heir she was. I reminded her that Quebecers still had much to learn from yesterday’s leaders not from today’s. That if “sang et langue” – blood and language – were still the litmus tests of legitimacy, then Laurier’s boast of a pluralist Quebec where, “It has been my great pride to be excommunicated by Roman priests and condemned by Protestant parsons,” was betrayed. With a half-sneer and a toss of her head that almost sent her earphones flying, she marched off. The sad reality is that too many in Canada as well as in Quebec, would gladly write apologias for this reporter. They would say I over-reacted. They would say she was misunderstood. But the truth is that in our land today there are too many who identify themselves not by what they are for, but only by what they are against. Too many who are ready to fall for anything, because they stand for nothing. Too many who have become small, petty people of low limitation and narrow circumstance. People who cannot fathom independence because as George Bernard Shaw wrote, “Liberty demands responsibility. That’s why so many dread it.” We have grown far too comfortable demanding rights but denying the responsibilities that go with them. Fuelled by a knee-jerk anti-Americanism that condemns any action of, or alliance with, America to political purgatory, we have lulled ourselves into a smug self-satisfaction laying slothfully in womb-like isolation. Our acceptance of failed cultures right to be wrong; our adherence to bankrupt notions of moral relativism, and our assumption of the gospels of political equivalency have led to a self-abnegation that permits no deviation from the most egregiously outlandish orthodox biases of political correctness. We willingly abdicate our personal sovereignty to the most ludicrous state dictates or fiats so long as we are let alone to indulge ourselves in diversions and distractions. It is our own secular version of Islamist submission to Mullahs and madmen. The reporter’s words were more searing than anything nature threw at us that morning. They demonstrated an inbred jealousy of the capacity for individual courage and consequence. A jealousy driven by a self-doubt arising from a lack of self-belief. A lack of self-belief too often in evidence today that compels so many to compromise and question anyone of purpose and principle who does not manifest fidelity to age-old inbred prejudices that act as armour against the discipline of intellectual rigour. A discipline that, if exercised, would mirror the stark reality of myriad failures. It is to be hoped that we can marshal a resolve to comprehend, in Robert Kennedy’s words, that “…courage is the cardinal human virtue…” And those prejudices – directed at Jews or any other ethnicity, religion or creed – are nothing but the swollen envy of pygmy minds that, if left unchecked will lead to our own undoing. The rain seared our faces like icicles falling off a roof ledge. It was incessant and unforgiving. But there we stood, our little band of brothers and sisters, on one of Montreal’s busiest downtown corners under an angry, gray October sky. We stood there because we wanted to purge ourselves of some of our anger. Earlier in the week it was announced that the usual coalition of deniers, defeatists and defenders of failed cultures’ “right to be wrong” had organized another “peace” march. This one called for Canada to withdraw its troops from Afghanistan and let the Taliban thugs work things out with the people they had oppressed for so long. Then the funny thing happened. I had told my new young friend that I could only stay for about an hour. Just as I was leaving, a reporter from a French-language radio station approached. She seemed pleasant enough and asked the organizer if he cared to make some comments. Though fluent in French he said that he was not used to speaking to reporters and guided her to me. There was no talk of the recent Middle East war, Iraq or any parochial particularities. We talked of the need to support Canada’s newly restored pride and purpose on the international scene. We discussed the merits of the Afghanistan mission. We spoke of the necessity of Canadians, as members of the family of free peoples, needing to guard against giving comfort to the enemies of freedom and compromising the survival and success of liberty. I described our little manifestation as a rally of conscience similar to the “Red Friday” rallies in support of our Forces that are held across the country. That it was to our city’s shame that we have had no “Red Fridays” here. I reminded her of what a Francophone Senator once told me. That the real “two solitudes” in Quebec were not between anglophones and francophones but between those francophones that were the heirs of Papineau and Lafontaine, Laurier and Trudeau, and those francophones who were the heirs of the era of “le grande noirceur”, Abbé Groulx and Adrien Arcand. I told her to reflect on whose heir she was. I reminded her that Quebecers still had much to learn from yesterday’s leaders not from today’s. That if “sang et langue” – blood and language – were still the litmus tests of legitimacy, then Laurier’s boast of a pluralist Quebec where, “It has been my great pride to be excommunicated by Roman priests and condemned by Protestant parsons,” was betrayed. With a half-sneer and a toss of her head that almost sent her earphones flying, she marched off. The reporter’s words were more searing than anything nature threw at us that morning. They demonstrated an inbred jealousy of the capacity for individual courage and consequence. A jealousy driven by a self-doubt arising from a lack of self-belief. A lack of self-belief too often in evidence today that compels so many to compromise and question anyone of purpose and principle who does not manifest fidelity to age-old inbred prejudices that act as armour against the discipline of intellectual rigour. A discipline that, if exercised, would mirror the stark reality of myriad failures. It is to be hoped that we can marshal a resolve to comprehend, in Robert Kennedy’s words, that “…courage is the cardinal human virtue…” And those prejudices – directed at Jews or any other ethnicity, religion or creed – are nothing but the swollen envy of pygmy minds that, if left unchecked, will in the final analysis lead to our own undoing.